The information presented on this page was originally released on March 11, 2004. It may not be outdated, but please search our site for more current information. If you plan to quote or reference this information in a publication, please check with the Extension specialist or author before proceeding. Incredible things are happening in the world of the tropical hibiscus when it comes to new colors. There are many new varieties, so remember to check your garden center this spring. Two of the newest to capture my heart are Acadian Spring and Sun Showers. Acadian Spring has huge blossoms with hints of pink, cream and lilac, and Sun Showers is indeed like a solar flare on the sun with orange, red and white. When you look at a tropical hibiscus blooming on your deck or patio, it is not hard to conjure up visions of the Caribbean and the sounds of a steel band. It's funny how plants can mentally take us to places our budget or time won't allow. With about 265 days of frost-free weather each year, our backyards can resemble the exotic look of the islands. All over the state, nurseries and garden centers have unloaded trucks of the tropical hibiscus known botanically as Hibiscus rosa-sinensis. 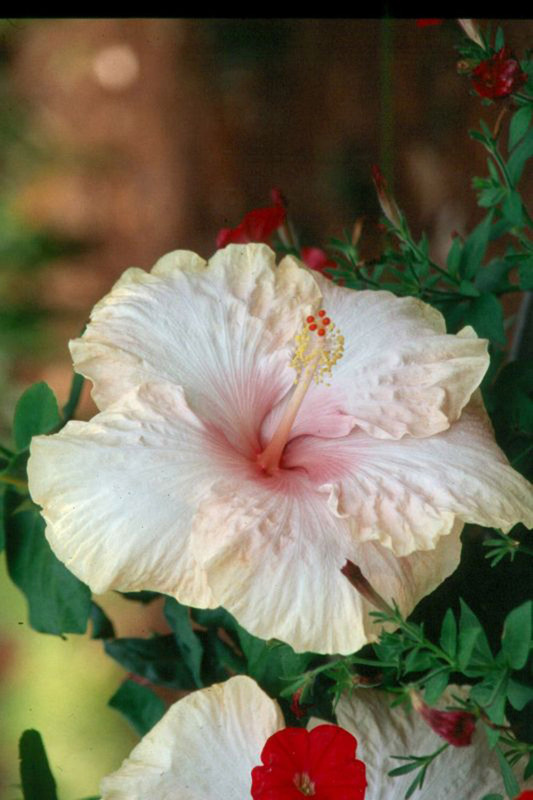 This hibiscus originated in China and is kin to our well-known cotton and okra plants. Today there are hundreds of varieties available in most colors you could want other than blue. The flowers are spectacular with bright oranges, yellows, reds, pinks, whites and blends of these colors. Some even have double blossoms. The dark green foliage is handsome and contrasts nicely with the beautiful flowers. The flowers generally stay open only for a day but are produced for months. Think about how you can use them in the landscape. Nothing can be more exotic than a large banana plant growing behind one of these shrubs. Or plant a yellow allamanda on a trellis behind some red, single-flowered hibiscus. Hibiscus belong in the landscape whether combined with bananas, cannas or some other tropical plant. The requirements are much like any other annual we grow. Plant your hibiscus in well-drained, well-prepared beds because they absolutely cannot take wet feet. Use a good layer of mulch to keep the soil evenly moist throughout the season. Choose a site with plenty of sunlight. Morning sun and filtered afternoon light are just about perfect in our state. Hibiscus blooms on new growth, so it is important to keep it growing vigorously throughout the season. Keep them well fed and watered during droughty periods. Many gardeners think that the prolific flower production of a hibiscus requires high amounts of super-bloom type fertilizers high in phosphorous. This is not the case. Hibiscus prefers a balanced fertilizer formula such as a 6-6-6. It prefers monthly, small applications of fertilizer. If you are growing hibiscus or any other plant in containers during the summer, they must be watered daily. Keep in mind that the nutrients quickly leach from the soil. You will have to dilute and apply a water-soluble fertilizer weekly, or add time-released granules monthly. 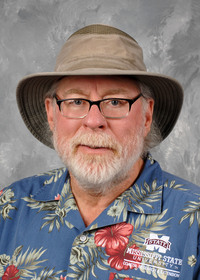 Periodically, we get calls from gardeners who get aphids and spray with malathion. 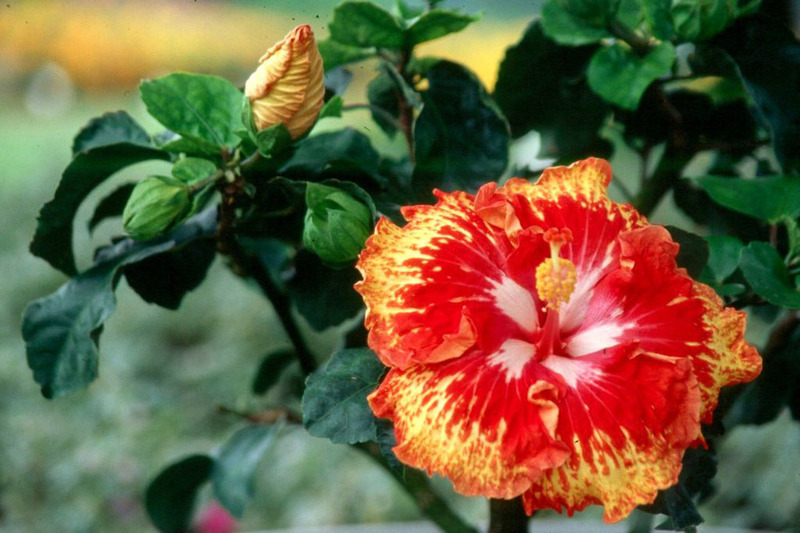 The hibiscus does not like this insecticide, and it results in severe foliage burn. Many times aphids can be simply picked off hibiscus buds. If the problem is severe, make sure your insecticide can be used on hibiscus. Read the label! Whether you are treating hibiscus, roses or any other plant during the summer, make sure they have been well-watered a couple of hours before the insecticide application. I kept one particular hibiscus that I really liked for more than 12 years. I would plant it in the landscape and when cold weather approached, I would dig it up, prune the roots and top and plant in a container with a light potting mixture. This example shows their ruggedness and the tightness of my pocketbook. They survive most winters on the Coast, but costs today allow us in zones 7 and 8 to use them as annuals in the landscape. Your garden center may not have Acadian Spring or Sun Showers, but look for the indescribable Fifth Dimension or one of a hundred others.